Ptarmigan photographed in the Northern Corries on Cairngorm mountain, beginning to lose the ermine phase plumage of winter. 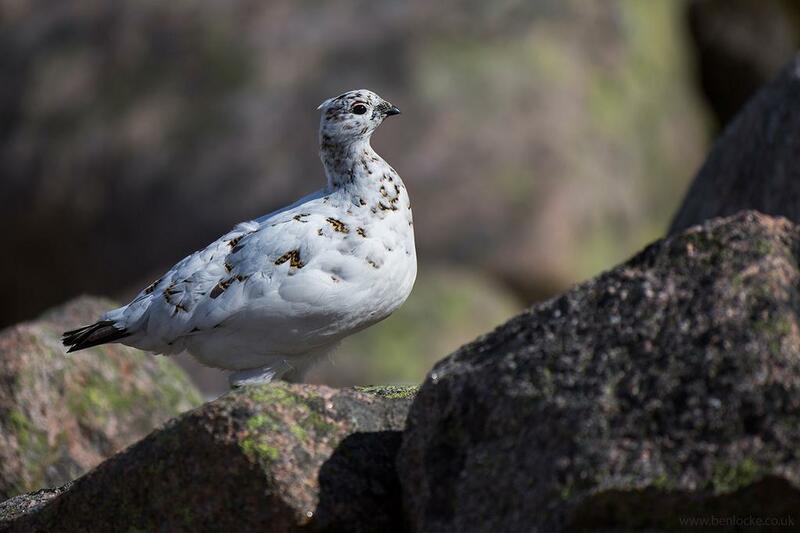 The Scottish race of the Ptarmigan is found only in Scotland, and is the only bird in Britain to turn white during winter. This gamebird has a rounded body, a small head and feathered feet that act as snow-shoes, allowing them to walk on soft snow. During summer, both sexes become greyish-brown, and females have more coarsely barred plumage with an overall yellowish hue. They blend in with lichen-covered rocks. In winter they turn totally white except for the short, black tail.